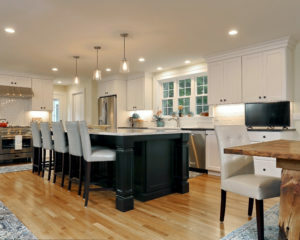 Getting Ready For Your Kitchen Installation - Wood Palace Kitchens, Inc.
A kitchen installation requires a lot of coordination to get the right materials and the right people in your home at the right time. You can help to ensure a successful kitchen installation by making sure your home is ready to receive the boxes and boxes of cabinetry and ready for the professional installation team to build your dream kitchen. Here is a list of the important things you need to do as the homeowner to make sure your home is kitchen installation ready. Make sure that the area where your kitchen will be installed is completely clear of all obstructions so the installation team has plenty of room to work. All existing appliances, cabinetry and countertops should be removed and all debris removed from the kitchen area. It is helpful and highly recommended that you have a rented dumpster on site to handle the removal of all debris, cartons, etc. Be prepared after the existing cabinetry is removed for some wall damage and repair which naturally occurs demolition and may also be needed if applicances and fixtures are being relocated during the remodel. All walls should be finished and completed with drywall and finished plaster before the kitchen installation. Final flooring material can be installed before the kitchen is installed but if the floors are wood, the final coat of finish or the final finishing should be done after the ktichen cabinets are installed. If you decide NOT to install the floors before the kitchen cabinets are installed, that is fine, but the installer will need a sample piece of the flooring material so the cabinets are built up enought to accommodate the floor thickness. CAUTION: If you are planning to keep the existing floors be sure you understand if the existing cabinetry is sitting on the floor or if the floor was laid around the cabinetry. Your new kitchen and applicances may not have the exact footprint as your old one and any differences will have to be fixed by the homeowner or the homeowner’s contractor. It is very difficult to match an existing floor so be sure to research this and make your decision accordingly and well before installation day. Make sure that your plumber and electrician have installed all of the rough plumbing and electrical where needed before the cabinetry arrives. The appliances and specs should be on site but not in the kitchen area. Cabinet hardware should be on site for the kitchen installation. This entry was posted in Kitchen Remodeling on March 7, 2018 by wpalace.